Guvnor is the business rules management system in Drools 5. When you deploy it out of the box, you get an unsecured web application that stores data in Jackrabbit’s embedded Derby database. 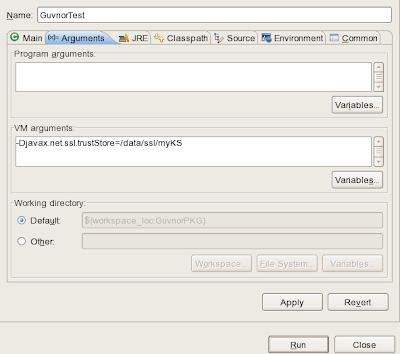 This article explains how to tune Guvnor deployed on JBoss Application Server 4.2.3. This means that we will use the container’s configuration files and security infrastructure. We will cover enabling password validation based on an LDAP server, moving from the default data repository, and enabling SSL for better security. 17:14:38,366 INFO  [TomcatDeployer] deploy, ctxPath=/drools-guvnor, warUrl=.../deploy/drools-guvnor.war/. Navigate to http://localhost:8080/drools-guvnor and login as 'admin' without any password. Guvnor is now up and running. Let’s see how we can get started quickly. Before you can start using Guvnor for rule authoring, you need to perform some basic setup. We will need to create a category, make a package, and upload your facts. Let’s log in. Create a category by clicking on ‘New category’ and providing a name. You can create a new package by providing its name (our example is myNewPackage) or by importing one from a drl file. In either case, you will need to provide the facts you’re going to use in your rules. Provide a name and select myNewPackage as the destination package. Provide a path (or click on Browse and navigate) to your facts archive. Finally, click on Upload. Before these facts are available in rules, you need to save this package. Click on ‘Save and validate configuration’. Validate and save your rule by first choosing ‘Validate’ and–if all is ok–then ‘Save changes’. Now you can make this package and all its rules available to your applications. Choose your package and click on ‘Save and validate configuration.’ Before building it, click on ‘Show package source’ to have a look at the whole package. When you’re done looking at the source, choose ‘Build package’. You should be able to access the package under http://localhost:8080/drools-guvnor/org.drools.guvnor.Guvnor/package/myNewPackage/LATEST and in drl format at http://localhost:8080/drools-guvnor/org.drools.guvnor.Guvnor/package/myNewPackage/LATEST.drl. Now let’s create a simple Drools application that will use a package served by Guvnor. RuleAgent(default) INFO (Wed Jul 23 20:31:29 CEST 2008): Applying changes to the rulebase. This was just a quick introduction into Guvnor. A much more exhaustive description can be found in the Guvnor documentation. We have now created an ‘admin’ user with the password ‘admin123′ and its role is ‘admin’. You may want to have all your users in a database or directory. For all available login modules, have a look at this wiki. In the current Drools 5M1 release, only the admin role is supported. You may want to have a look at drools-guvnor/src/main/java/org/drools/guvnor/server/security/RoleTypes.java for other roles implemented in future releases. Currently it looks like roles provided by JAAS login modules are ignored and have to be set inside Guvnor in the Admin section (not available in M1 release). However this is under development and may change. For more detailed instructions, look at the INSTALL file or the OpenLDAP Administrator's Guide. Since this is a self-signed certificate we will need to add it to the client's (JBoss AS) truststore. $ chown -R mysql5 . $ chgrp -R mysql5 . $ chown -R root . Now the DB side is complete. <!DOCTYPE Repository PUBLIC "-//The Apache Software Foundation//DTD Jackrabbit 1.4//EN"
As you see we're using the com.mysql.jdbc.Driver, so we need to provide it. 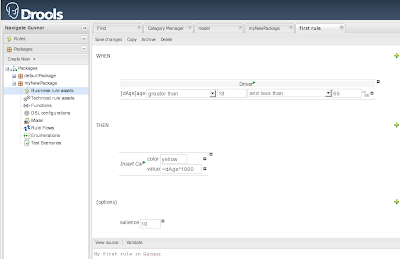 Download the mysql java connector from MySQL, unzip it, and copy the JAR file to $JBOSS_SERVER/lib. (I'm using mysql-connector-java-5.1.6). Now you can start the app server. If you have exported your assets, just go to the 'Administration' menu, expand 'Admin,' choose 'Import/Export,' and import your xml file. Please note that you have to unzip your exported xml file before you can upload it. The last tweak is enabling SSL. It not only provides security, but also ensures the transmitted data hasn't been modified. This is strictly a server-side task. Is CN=My Name, OU=My Department, O=My Company, L=My City, ST=My State, C=US correct? The last part of this article shows how you can access a drools package from Guvnor in a secure way. This is very straight forward if you use certificates signed by trusted authorities. In our test environment, it's a little bit more complicated since we use self-signed certificates. RuleAgent(default) EXCEPTION (Wed Jul 23 20:38:04 CEST 2008): Was unable to reach server.. Stack trace should follow. Now your Drools application runs in a secure environment. This article has shown how you can upgrade your BRMS, which should only be deployed out-of-the-box for testing purposes. For a multiuser environment with mission-critical applications, Guvnor should be tuned. Have a look at this blog post, the JSSE Reference Guide or the key tool docs page for more details about the tools we used. For LDAP browsing I recommend this very user-friendly and light-weight tool. ception: URI for index 11 not registered. 14:17:19,851 INFO [STDOUT] ERROR 29-12 14:17:19,851 (ConnectionRecoveryManager. I have the same error, any suggestions? I got the same error with Drools 5 CR1. In my case I fixed the problem when I set in $GUVNOR/WEB-INF/components.xml the < property name="homeDirectory">c:/data/GuvnorRepo/\< /property> to an absolute path. After that the deployment is successfully. I got similar error after configuring MySQL, but related to BundleDbPersistenceManager. 2009-07-15 04:32:30,875 INFO [STDOUT] ERROR 15-07 04:32:30,875 (BundleDbPersistenceManager.java:loadBundle:1228) failed to read bundle: cafebabe-cafe-babe-cafe-babecafebabe: java.lang.IllegalStateException: URIIndex not valid? javax.jcr.NamespaceException: URI for index 11 not registered. ERROR 23505: The statement was aborted because it would have caused a duplicate key value in a unique or primary key constraint or unique index identified by 'SQL090715032535010' defined on 'DEFAULT_BUNDLE'. I followed the steps in configuring MySQL and i have same error while deployment. ERROR 23505: The statement was aborted because it would have caused a duplicate key value in a unique or primary key constraint or unique index identified by 'SQL090729054055150' defined on 'DEFAULT_BUNDLE'. Appending to my comment above about workspace.xml. An better way to do this is to simple delete the \jboss-x.x.x.x\bin\repository\ directory. The next time you restart JBoss, it will recreate the directory, and the workspace.xml will now have the values you set in repository.xml. I am using Drools guvnor to send rule based emails. Is there a way to increase the number of rules in a decision table. Kind attention in this regard is highly appreciated. Any help is very welcome and appreciated. 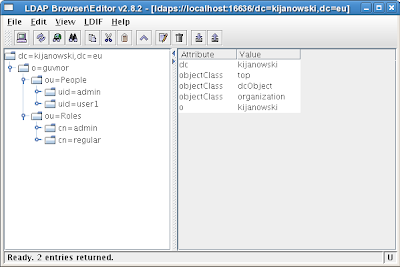 Do you have any suggestion for securing the ldap admin password?